Every history text, whether in books [popular, academic, and fictional], academic journals, the popular press, and on screens theatrical, computorial, and cellular]. The history we learned as a child born at the very inception of the Post World War II Baby boom we learned at the knees of mother born to a Danish Klansman and 32nd Degree Freemason and a spouse who belonged to the Daughters of the American Revolution and a father sired by two Pennsylvania Dutch settlers invited to settle in a state tolerant of all religions by its founder, William Penn. Three great-grandfathers fought for the Union in the Civil War, a conflict that loomed large in from our earliest forays into print, and avidly consumed whenever it appeared on movie screens, radio dramas, and then on the black-and-white, often fuzzy, and oddly compelling screen of the bulky console television set dramatically introduced into our living room shortly before we turned six [we were one of the first homes in Abilene, Kansas, making us very popular with neighbors, both young and old]. Unlike today, overtly fascist perspectives were then largely limited to utterances by bad guys in novels or in the World War II-based action flicks that dominated the screen or by subscribing to costly mimeographed “newsletters” mailed in plain brown wrappers or via envelopes with post office box numbers for the return address. America was then dominated by systems of legally mandated racial and religious segregation, drawn up by and for the melanin deficient, a fact confronted at water fountains, soda fountains, restaurants, theaters, club rooms, classrooms [with the Three Rs of Race, Religion, and Region, where one state’s War Between the States was another’s War of Northern Aggression], church pews, courtrooms, and clubrooms. . . and, well, just about everywhere. Our passion for history was learned first at the knees on our paternal grandmother, whose father commanded a Union cavalry forward scout company in a regiment at the very spearhead of Sherman’s March to the Sea, a campaign that left him with both a lifelong lung disease and insurmountable case of nostalgia, now better known as Post-Traumatic Stress Disorder. Through her stories, history became both intimate and vivid, most especially because she’d had direct contact with two of the most dominant figures in he media of the day: As a baby she’d perched on the knee of town Marshal, James Butler “Wild Bill” Hickock, a figure then-poplar in fiction, film, and [especially for us] television, while as a teenager armed with a high school diploma and a graduation certificate who taught a bright young kid from the wrong side of the tracks how to read and write, a kid who went of to West Point and to lead the Allied armies in Europe during World War II, then served at the helm of Columbia University before becoming President when we six year’s old, Dwight David Eisenhower. Grandma Brenneman rode in a float and we were in the crowd when Ike came to town to announce his run for the White House. We’ve lived long enough to have seen radical changes in the construction of our remembrance of things past, acquiring along the way what a former editor called “a profound sense of history, especially for one as young as you” [we were then 37]. Back in third grade we learned cursive, and the even before we were able to write our own name, we insisted our teacher instruct us in writing archaeology, the vocation which we were then certain would be out life.s work [a confrontation with the realities of academic departmental politics would later lead us to take dig in more contemporaneous dirt as a journalist]. We amassed a sizeable and still-growing library of books about the cultures of ancient Egypt, Mesopotamia, Greece Rome, Mesoamerica, and Asia, allowing us to feast on images of ruined cities and splendid artifacts and stories people and civilizations long vanished. We dreamt of digging in ancient ruins [an aspiration realized on a collegiate dig of an ancient kiva outside Taos, New Mexico]. But now a menace we know all too well threatens to inundate many of world’s most memorable ancient sites, with some very famous names on a the endangered species list. Flood risk index at each World Heritage site under current and future conditions. [a] In 2000 and [b] in 2100 under the high-end sea-level rise scenario. From Nature open access]. UNESCO World Heritage sites in the Mediterranean such as Venice, the Piazza del Duomo, Pisa and the Medieval City of Rhodes are under threat of coastal erosion and flooding due to rising sea levels, a study published in Nature magazine reports this week. The study presents a risk index that ranks the sites according to the threat they face from today until the end of the century. The sites featuring highest on this index in current conditions include Venice and its Lagoon, Ferrara, City of the Renaissance and the Patriarchal Basilica of Aquileia. 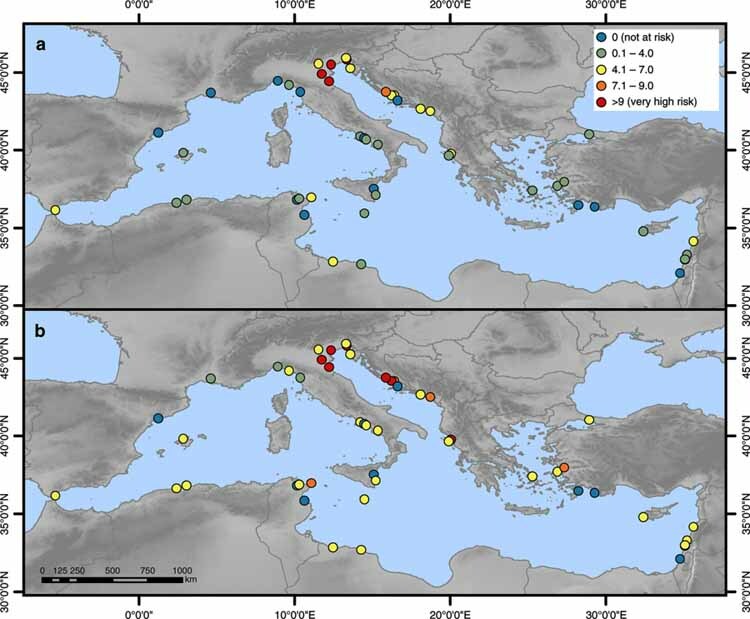 All these sites are located along the northern Adriatic Sea where extreme sea levels are the highest because high storm surges coincide with high regional sea-level rises. The sites most at risk from coastal erosion include Tyre, Lebanon, the Archaeological Ensemble of Tarraco, Spain, and Ephesus, Turkey. The study, led by Lena Reimann at Kiel University, Germany, working with University of Southampton coastal scientist, Dr Sally Brown and Professor Richard Tol from the University of Sussex combines model simulations with world heritage site data to assess the risk of both coastal flooding and erosion due to sea level rise at 49 UNESCO coastal Heritage sites by the end of the century. They find that of the sites, 37 are at risk from a 100-year flood event (a flooding event which has a 1% chance of happening in any given year) and 42 from coastal erosion today. By the next century flood risk may increase by 50 % and erosion risk by 13 % across the region, and all but two of the sites (Medina of Tunis and Xanthos-Letoon) will be at risk from either of these hazards. The Mediterranean region has a high concentration of UNESCO World Heritage Sites, many of which are in coastal locations as human activity has historically concentrated around these areas. Rising sea levels pose a threat to these sites as the steep landscape and small tidal range in the area has meant settlements are often located close to the waterfront. The report says that more information on the risk at a local level is needed and the approaches to adaption and protection varies across the region due to large social and economic differences between Mediterranean countries. The authors have identified areas with urgent need for adaptation planning and suggest the iconic nature of such sites can be used to promote awareness of the need to take action to mitigate climate change. In some cases relocation of individual monuments, such as the Early Christian Monuments of Ravenna or The Cathedral of St. James in Šibenik, may be technically possible though not for other sites which extend over large areas such as urban centres, archaeological sites and cultural landscapes. We suspect the White House to take no action, unless Donald Trump finally realizes his own hotels and golf courses may soon become water hazards. After all, the only history that matters to him is sexual and financial. Now that Georgia’s Republican Secretary of State is claiming – based on no evidence whatsoever – Democrats have hacked his state’s election, it’s time for a reminder of the identity of the world’s number one election-rigger. Meddling in foreign elections is bad. I think we can all agree on that. And almost everyone – bar Donald Trump – seems to believe that the Russian government meddled in the 2016 election. So that should be condemned. Here’s the problem, though: U.S. politicians and pundits cannot credibly object to Russian interference in U.S. elections without also acknowledging that the United States doesn’t exactly have clean hands. Or are we expected to believe that Russian hackers were the first people in human history to try and undermine a foreign democracy? In this video, I examine the ways in which the the United States has, in fact, spent the past 70 odd years meddling in elections across the world. For decades, American intelligence agencies have historically used clandestine tactics to put leaders into office who are favorable to U.S. national interests. This practice of meddling dates back to the early days of the CIA and was seen as a necessary strategy to contain the Soviet Union during the Cold War. It’s something Tim Weiner has explored in great detail. He’s won the Pulitzer Prize for his work on clandestine national security programs, and his books include “Enemies: A History of the FBI” and “Legacy of Ashes: The History of the CIA.” He says election meddling is not a grey area for the CIA. After seeing success in Italy, the CIA took this formula — which involved using millions of dollars to run influence campaigns — and brought it across the world to places like Guatemala, Indonesia, South Vietnam, Afghanistan, and beyond. Dov Levin, a researcher with the Institute for Politics and Strategy at Carnegie Mellon University, created a historical database that tracks U.S. involvement in foreign elections. According to Levin, the U.S. meddled in other nation’s elections more than 80 times worldwide between 1946 and 2000. Examples include Italy in 1948; Haiti in 1986; Nicaragua and Czechoslovakia in 1990; and Serbia in 2000. A more recent example of U.S. election interference occurred in Israel in 2015. A Washington Post report in 2016 revealed U.S. taxpayer dollars were used in an effort to oust Israeli Prime Minister Benjamin Netanyahu. According to a bipartisan report from the Permanent Subcommittee on Investigations (PSI), $350,000 in grants from the U.S. State Department were used “to build valuable political infrastructure—large voter contact lists, a professionally trained network of grassroots organizers/activists, and an impressive social media platform” not only to support peace negotiations, but to launch a large anti-Netanyahu grassroots organizing campaign. Through the years, the U.S. has also gone so far as to fund the election campaigns of specific parties; make public announcements in favor of the candidates they support; and threaten to withhold foreign aid should voters favor opposition candidates. According to his research, there were 117 “partisan electoral interventions” between 1946 and 2000. That’s around one of every nine competitive elections held since Second World War. The majority of these – almost 70 per cent – were cases of US interference. And these are not all from the Cold War era; 21 such interventions took place between 1990 and 2000, of which 18 were by the US. It’s important to note that these cases vary greatly – some simply involved steps to publicly support one candidate and undermine another. But almost two thirds of interventions were done in secret, with voters having no idea that foreign powers were actively trying to influence the results. It’s not clear how much impact Washington’s efforts had: Levin figured the vote increase for U.S.-backed candidates averaged three percent. The consequences often didn’t seem to satisfy Washington; in almost half of the cases America intervened at least a second time in the same country’s electoral affairs. Woolsey served as CIA director under former President Clinton. His comments follow a federal indictment released on Friday that accused 13 Russian individuals and three Russian groups of attempting to influence the 2016 presidential election. 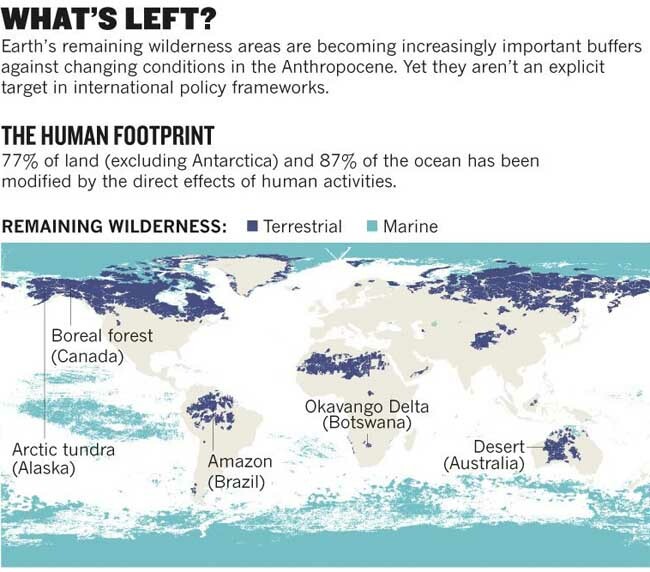 The world’s last wilderness areas are rapidly disappearing, with explicit international conservation targets critically needed, according to University of Queensland-led research. The international team recently mapped intact ocean ecosystems, complementing a 2016 project [$2.99 for three-hour access] charting remaining terrestrial wilderness. Professor James Watson, from UQ’s School of Earth and Environmental Sciences, said the two studies provided the first full global picture of how little wilderness remains, and he was alarmed at the results. “A century ago, only 15 per cent of the Earth’s surface was used by humans to grow crops and raise livestock,” he said. “Today, more than 77 per cent of land – excluding Antarctica – and 87 per cent of the ocean has been modified by the direct effects of human activities. “It might be hard to believe, but between 1993 and 2009, an area of terrestrial wilderness larger than India — a staggering 3.3 million square kilometres — was lost to human settlement, farming, mining and other pressures. UQ Postdoctoral Research Fellow James R. Allan said the world’s remaining wilderness could only be protected if its importance was recognised in international policy. “Some wilderness areas are protected under national legislation, but in most nations, these areas are not formally defined, mapped or protected,” he said. “There is nothing to hold nations, industry, society or communities to account for long-term conservation. The researchers insist that global policy needs to be translated into local action. “One obvious intervention these nations can prioritise is establishing protected areas in ways that would slow the impacts of industrial activity on the larger landscape or seascape,” Professor Watson said. “But we must also stop industrial development to protect indigenous livelihoods, create mechanisms that enable the private sector to protect wilderness, and push the expansion of regional fisheries management organisations. The article has been published in Nature [open, read-only access]. Nothing has contributed more to the rise of 21st Century global fascist populism than the surge of refugees from the war zones of Middle East and North Africa [MENA], and Latin America as darker-skinned folks fleeing from crises zones flood the paler-skinned nations of North America and Europe.. 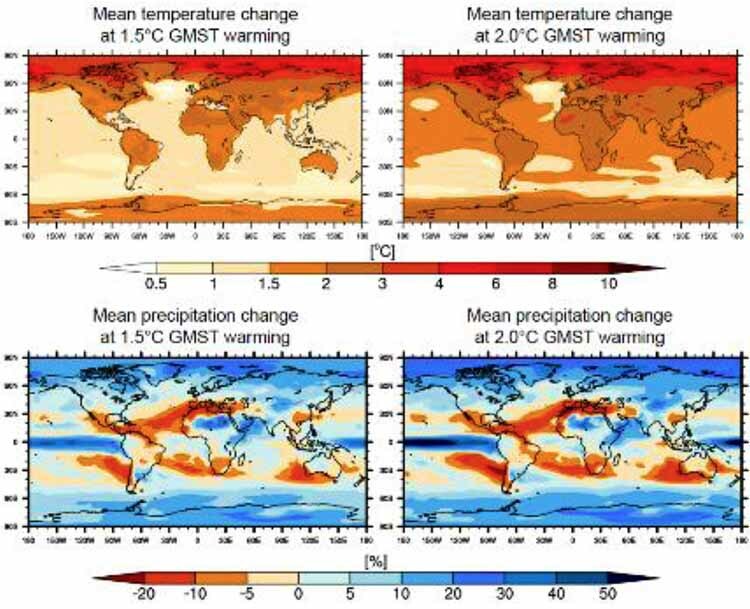 Projected mean temperature [top] and mean precipitation changes [bottom] at 1.5°C global warming [left] and 2°C global warming [right] compared to pre-industrial time period [1861-1880]. As both Mexico and the MENA region fall victim to a drastic reduction in precipitation and higher temperatures in areas already marked by soaring violence, life will grow harder and the temptation to flee grows ever stronger, tensions in the the developed world can only grow stronger as violent and virulent populism soars. In all the regions affected, U.S. foreign policy has favored oppressive tyrants, installed with the backing of military forces from the developed North, backed by banksters and corporateers eager to “develop” the resources of the afflicted regions, including oil, agriculture and water. For those nostalgic for the Obama years, consider the military campaigns that the “liberal” administration sponsored, actions which only stoked the flames. The Trump administration has only added more fuel to the flames by pulling the U.S. out of the climate accord, setting the stage for more refugees and the accelerated rise of fascist parties in the North. In 2016, 1,204,300 first-time asylum seekers applied for international protection in the Member States of the European Union (EU), a number slightly down compared with 2015 (when 1,257,000 first-time applicants were registered) but almost double that of 2014 (562,700). Syrians (334,800 first-time applicants), Afghans (183,000) and Iraqis (127,000) remained the main citizenship of people seeking international protection in the EU Member States in 2016, accounting for slightly more than half of all first time applicants. With 722 300 first time applicants registered in 2016, Germany recorded 60% of all first-time applicants in the EU Member States. It was followed by Italy (121,200, or 10%), France (76,000, or 6%), Greece (49,900, or 4%), Austria (39,900, or 3%) and the United Kingdom (38,300, or 3%). Among Member States with more than 5,000 first time asylum seekers in 2016, numbers of first time applicants rose most compared with the previous year in Greece (38,500 more first time asylum seekers in 2016 than in 2015, or +339%), Germany (280.500 more, or +63%) and Italy (37,900 more, or +46%). In contrast, the largest decreases were recorded in the Nordic Member States – Sweden (-86%), Finland (-84%) and Denmark (-71%) – as well as in Hungary (-84%), Belgium (-63%), the Netherlands (-55%) and Austria (-53%). Compared with the population of each Member State, the highest number of registered first-time applicants in 2016 was recorded in Germany (8.789 first-time applicants per million inhabitants), ahead of Greece (4,625), Austria (4,587), Malta (3,989), Luxembourg (3,582) and Cyprus (3,350). In contrast, the lowest numbers were observed in Slovakia (18 applicants per million inhabitants), Portugal (69), Romania (94), the Czech Republic and Estonia (both 114). In 2016, there were in total 2,360 first time asylum applicants per million inhabitants in the EU as a whole. 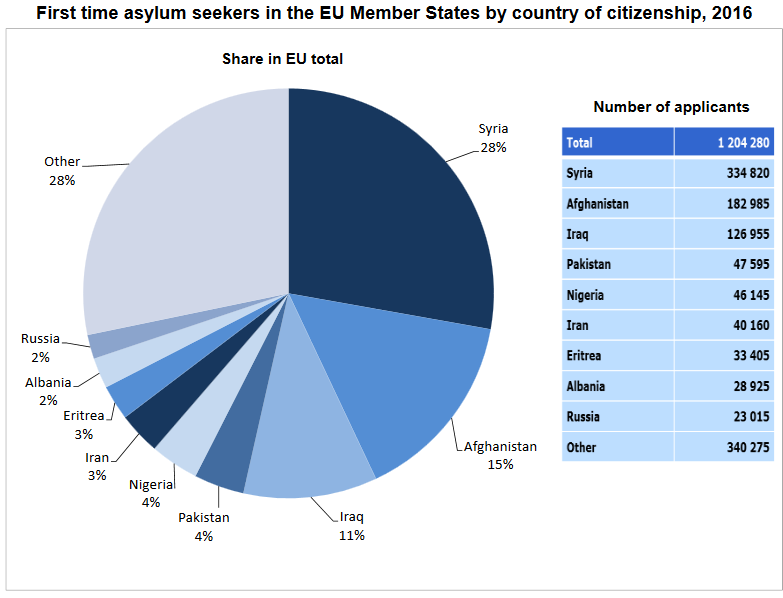 Syria (28% of the total number of first-time applicants) was again in 2016 the main country of citizenship of asylum seekers in the EU Member States. Of the 334,800 Syrians who applied for the first time for asylum in the EU in 2016, almost 80% were registered in Germany (266,250). In total, Syrians represented the main citizenship of asylum seekers in thirteen EU Member States. Afghanistan (15% of the total number of first-time applicants) remained the second main country of citizenship of asylum seekers in the EU Member States in 2016. Of the 183,000 Afghans seeking asylum protection for the first time in the EU Member States in 2016, nearly 70% applied in Germany (127,000). Afghans represented the main citizenship of asylum seekers in five EU Member States. With 127,000 first -time applicants (or 11% of the EU total) in 2016, Iraq was the third country of citizenship of asylum seekers in the EU Member States. Three-quarters applied in Germany (96,100). Hey, nothing’s got to stand of the way of business, right? They’re so darn inconvenient anyway, right? The idea behind the rule, which had bipartisan support, was to drain militias of revenue by forcing firms to conduct reviews of their supply chain to determine if contractors used minerals sourced from the militias. The impending decision comes as Trump held a meeting Wednesday with Brian Krzanich, the chief executive of Intel, one of the leading firms impacted by conflict mineral regulations. At the White House today, Krzanich appeared with the president to announce a new manufacturing plant in Arizona. Human rights advocates — who had celebrated the conflicts rule as a major step forward — were appalled. “Any executive action suspending the U.S. conflict minerals rule would be a gift to predatory armed groups seeking to profit from Congo’s minerals as well as a gift to companies wanting to do business with the criminal and the corrupt,” said Carly Oboth, the policy adviser at Global Witness, in a statement responding to a Reuters article that first reported the move. It’s a stealthy invader, an illegal immigrant, and it threatens to cause still more instability in a continent struggling with conflict and First World profiteers, but its impacts portend famine and yet more instability and violence. Making matters worse, the invasion comes at a critical moment when the continent faces imminent threats from drought and climate change. New research announced by scientists at CABI (Center for Agriculture and Bioscience Information) confirms that a recently introduced crop-destroying armyworm caterpillar is now spreading rapidly across Mainland Africa and could spread to tropical Asia and the Mediterranean in the next few years, becoming a major threat to agricultural trade worldwide. Fall armyworm is native to North and South America and can devastate maize production, the staple food crop that is essential for food security in large areas of Africa. It destroys young plants, attacking their growing points and burrowing into the cobs. An indigenous pest in the Americas, it has not previously been established outside the region. In the past year, it was found in parts of West Africa for the first time and now a UK based CABI-led investigation has confirmed it to be present in Ghana. It can be expected to spread to the limits of suitable African habitat within a few years. Plant doctors working in CABI’s Plantwise plant clinics, which work to help farmers lose less of what they grow, have found evidence of two species of fall armyworm in Ghana for the first time. This has been confirmed by DNA analysis undertaken at CABI’s molecular laboratory in Egham, Surrey (UK). In Africa, researchers are working to understand how it got there, how it spreads, and how farmers can control it in an environmentally friendly way. The once-fertile fields of South Africa’s Western Cape region are filled with scorched patches of earth, dying plants, and wasted crops. The scene is now common throughout eastern and southern Africa, as droughts for three consecutive years have decimated crops and caused widespread hunger. New research indicates that it is partly due to climate change driven by human action, which has worsened the El Niño weather phenomenon. “This is about as bad as it has ever been,” said Chris Harvey, as he walked to his farm´s irrigation dam, where the water level has fallen six metres in 10 months. “We might not be able to grow any vegetables next year,” his wife Sue added. Dams in the area are drying out, symptomatic of the continent´s battle with years of poor rainfall. The droughts in eastern and southern Africa beginning in 2015 have affected tens of millions of people. The latest numbers from the UN suggest that 24 million people are facing food insecurity in eastern Africa alone, not counting millions of people in the southern region. According to a new study published by the American Meteorological Society, such conditions will become increasingly normal as climate change takes its toll. “We are advising governments to expect yearly disasters, droughts, floods, and also now diseases,” David Phiri, the UN´s food and agriculture coordinator in Southern Africa, told IRIN.